Fresh seafood options in different guises abound at Sakae Sushi this Chinese New Year. I recall when we grew tired of the same old Chinese fare at family gatherings, we’d turn to Japanese cuisine for a change of palate. In such trying times when our shringgit lose its buying power, thank goodness we can still afford a decent celebratory meal at Sakae Sushi. For the Year of the Fire Monkey, Sakae chefs have joined the fray by proffering a Japanese take of yee sang. Airflown, thick slices of salmon form the heart of delicious Fortune Salmon Yee Sang (Success set at RM29.98 for 2-3 persons, Money set at RM56.98 for 6-8 persons with add-on options available). 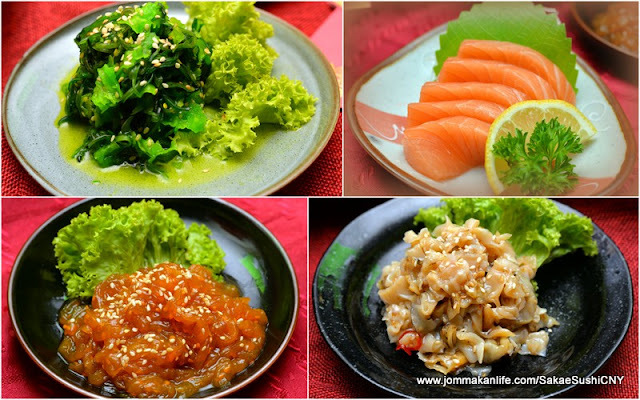 According to June Yew (above pix - centre), GM of Marketing, the yee sang is Sakae's annual best-seller and customers can customise their order with salmon sashimi, seasoned scallop, jellyfish or mekabu seaweed. Available for dine-in and takeaway, the appetising salad with seasoned jellyfish, seaweed, shredded radish and carrot, pickles and a citrus-infused sauce come together to create a refreshing combo that’s easy on the eye and worth relishing too. Treating the clan need not be a costly affair. The trick is to order the Happiness Treasures (RM98) which features Sakae’s signature Fortune Yee Sang (Money set) alongside 10 types of popular sushi selection made by Sakae chefs using Vitamin E-added sushi rice and imported ingredients. A serving should be ample enough to feed 6 persons. Kids and cheese lovers can relish Salmon Cheese Roll (RM16.99) too. These delectable rice chunks rolled with salmon, crabstick, Japanese omelette and cucumber are finished off with slightly torched cheese and some spicy mayo. For older folks or those eschewing raw stuff, fret not. A platter of Golden Abundance (RM49.90) should please them. With goodies like mini ebi tempura, fried hotate (scallop), soft shell crab and kani (crabstick) among others, the golden brown morsels served with spicy mayo came up to scratch. Nobody would mind getting into hot soup of the Salmon Kabuto Nabe (RM19.99). A hearty Japanese hot pot cooked with salmon head, we found assorted mushroom and vegetable immersed in the appetising broth. A viable choice to satisfy both young and old. Much as I like mentaiko or cod fish roe, the overly generous blanket of creamy cod fish roe somehow proved a tad overwhelming for the Hotate Mentaiyaki (RM10.99 for two pieces) which consists of half shell scallops. The same topping reappeared in the Salmon Mentaiyaki (RM18.99) as well so unless you’re partial to mentaiko, it’s best to opt for one or the other in the same sitting. Remember the adage about too much of a good thing…the salmon was moist but a tad overcooked for my personal liking. We were stuffed when dessert arrived but like the saying goes, there’s always room for sweet treats. I was smitten with the Karinto Manjyu & Ice Cream (RM11.99), an enticing golden brown sugar bun filled with red bean paste. Complemented by green tea ice cream, its caramel taste reminded me of sarang semut, a local spongy cake with honeycomb texture. In conjunction with the CNY period, diners will be rewarded when they spend minimum RM80 thanks to Sakae Sushi Prosperity Giveaways. Gifts range from limited edition angpows, vouchers, gift cards entitling them to win special prizes such as Fortune Rong Rong and Lucky Mon Mon plush toys which symbolise prosperity and happiness respectively. You can also join the Pose for Prosperity Facebook contest which runs until 29 February. Just snap a creative pose with the “Toss to Prosperity” yee sang standee in front of Sakae Sushi and upload it to the brand’s FB page. Hou or monkey in Chinese sounds similar to good so naturally this Chinese astrology sign grabbed the limelight at the prosperity yee sang with fresh salmon presentation at Toh Yuen, Hilton PJ for our media review. Us shutterbugs simply couldn’t stop snapping away at the Instagrammable creation before dinner! The yee sang tasted as good as it looked too. Chinese Executive Chef Ben Lim has stuck to tradition with loads of multi-colour, fried flour crisps, assorted pickles: ginger, leek and onion, shredded carrot and radish, fresh pomelo sacs, shredded kaffir lime leaves and pok chui (deep-fried flour crackers) and fresh slices of raw salmon. Once the whole platter was tossed and stirred to boisterous shouts of lou sang, the mixed salad turned out to be delicious thanks to the bright, well-balanced melange of sweet, savoury, mildly spiced, briny, tangy and even faintly bitter accents. Augmented by thick fresh salmon slices, we made quick work of the salad. Liquid intake in recent scorching weather is a must and the restorative double-boiled fish maw soup with black mushroom & dried scallop was most welcomed. With slippery smooth fish maw (fa kau), conpoy, black mushroom and wolfberries double-boiled for hours, the salubrious broth really hit the spot. The biggest show-stealer of our preview was steamed imperial chicken with Chinese herbs and seamoss. Just a whiff of the pungent woody, herbal aroma sent our salivary glands into overdrive and we soon picked the bones clean of the chook. The sublime sauce would have gone superbly with some white rice but we resisted. Abundance certainly came our way after we relished every bit of the Teochew style steamed pomfret. The fish’s inherent sweetness was discernible, the flesh soft and plump. Pickled mustard (ham choi), sliced black mushroom and custard-soft beancurd helped to boost the dish’s texture and taste profiles too. You’d laugh with delight upon tasting the deep-fried prawns with lemon mayonnaise sauce. Topped with coarsely ground nuts, the springy shelled crustaceans in a light coating of lemon-infused mayo 'rocked' our palate. Underneath was some diced fruit tossed in mayo, lending unexpected creamy sweetness to the equation. CNY is possibly one of the major occasions when pricey ingredients appear on the festive menu. Nothing screams luxury like stewed whole abalone with Australian sea cucumber & seamoss so I daresay we dined like a boss that night. Only good manners stopped most of us from licking the plate clean! Instead of lap mei farn (rice with waxed meat), we raved over the packets of steamed glutinous rice with dried oyster wrapped in lotus leaf. Suffused with the distinctly rustic scent of the lotus leaf, the rice was a total win. Added with the subtly smoky dried oysters, the parcels of irresistible, soulful offering got the thumbs up. Dessert was kept light yet sweet with osmanthus/sweet olive with lemongrass jelly accompanied by CNY cake (nin kou) with desiccated coconut. While the mildly sweet broth proved to be a nice palate-cleanser, we wished freshly grated coconut had been used in place of the dry, sawdust-like desiccated coconut. Such a pity that dismal, rancid overtone marred an otherwise perfect celebratory dinner. Yee sang is available in regular (2-5 persons) and large (6-10 persons) servings, starting from RM98 onwards up to RM258. Toh Yuen’s set menus are priced at RM1,618 (Everlasting Happiness Set), RM1,968 (Luck & Joyfulness) or RM2,308 (Sea of Prosperity) per table of 10 persons; available for lunch and dinner until 28 February. For reservations, call Toh Yuen, tel: 03-7955 9122 x 4073. Hilton Petaling Jaya, Jalan Barat, Petaling Jaya, Selangor. Effective 11 May 2016, 2OX has become a pork-free restaurant. Pork dishes mentioned in this review are no longer in the current menu. The petite powerhouse behind Maison Francaise Sainy Chun has done it again with 2OX. 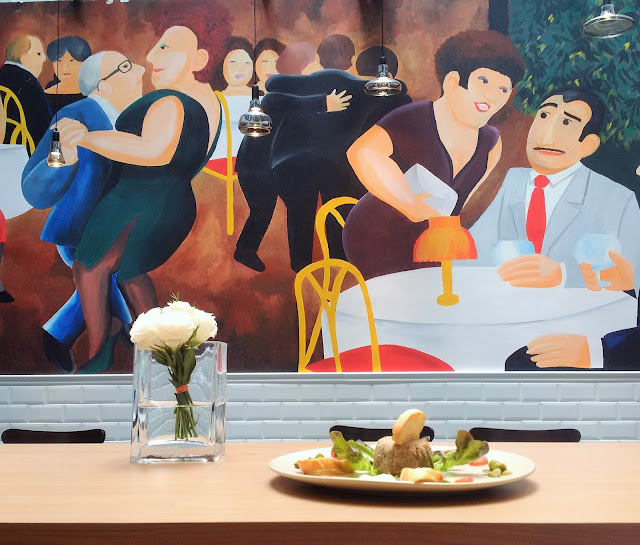 Her months-old bistro venture at The Row (formerly Asian Heritage Row) fits in nicely with the revitalised F&B hub, bringing the art of French bistronomy to KL. Channelling the effortless downhome chic of French bistros with tasteful facets: pristine white tiled walls, pared-down linear décor and edgy industrial finish, 2OX is out to draw those yearning for reasonably priced French dining with its array of exquisite, rustic specialities. A vibrant canvas of voluptuous, carousing personas take centrestage on the feature wall while smaller, intermittent bursts of colour from framed artworks act as supporting cast. The brief bistro-style menu is ample enough to leave you in a quandary on what to choose. Francophiles will lament everything sounds tempting! The Duck Rillettes with Pickled Gherkins (RM38) won the appetiser tussle alongside Fresh Mozzarella with Tomatoes and Jamon Ham (RM48). We love the rillettes – a traditional speciality features pork, rabbit, goose or other poultry cubed, salted and cooked in lard to tenderise the meat before it is shredded to coarse paste-like consistency. Known in some parts of France as ‘brown jam’, our serving came with toasted baguette and housemade pickled gherkins and pearl onions, cherry tomatoes and lettuce. The inherent gaminess and richness which reminded me of moist meat floss with subtly sweet-tangy baby gherkins and pearl onions layering their distinct flavours to the spread. For us, the day’s showstopper belonged to the unbelievably tender Josper Oven Grilled Pork Chop (RM75). My mouth still waters at the memory of the tender meat’s juicy sweetness and spot-on doneness. Heeding the recommendation to sample Les Tripe with Tomato and Spicy Herbs (RM58) also paid off. If you’re a fan of offal like us, the textural symphony: spongy chewiness interjected with slippery flabby bits should hold great appeal. I mopped up every drop of the robustly sublime gravy with bread. Dessert consists of cherished classics like Crème Brulee (RM15) and Bourguignon Pear and Vanilla Ice Cream (RM20). The former came up to par while the pieces of red wine-suffused pear in the latter was surprisingly sedate. Great if you prefer ethereally light treats that leave you humming with good vibes. For dinner, you can enjoy a 3-course set at RM88++ per person comprising one cold or warm appetiser, one main and one dessert. Certain dishes come with additional charges so consult with the 2OX team for an ox-cellent dining experience. Pair your choice of dishes up with some wine, served by the glass at RM20-RM28 each. For reservations, call 2OX, tel: 03-2692 2233. Address: 56G, Jalan Doraisamy, Kuala Lumpur.